A skydiving experience is one of those adventures you’ll forever cherish, talk about with friends, and re-live in your mind. 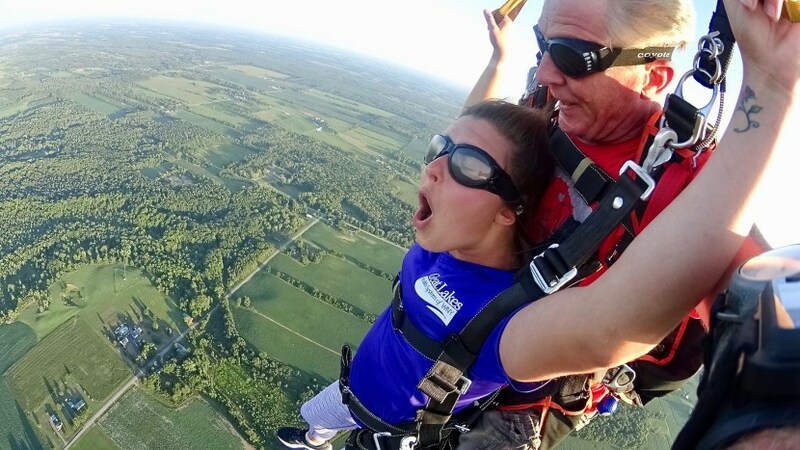 At WNY Skydiving, we know the impact a first jump can have on a person, so we aim to give our first time tandem skydivers the very best experience possible. 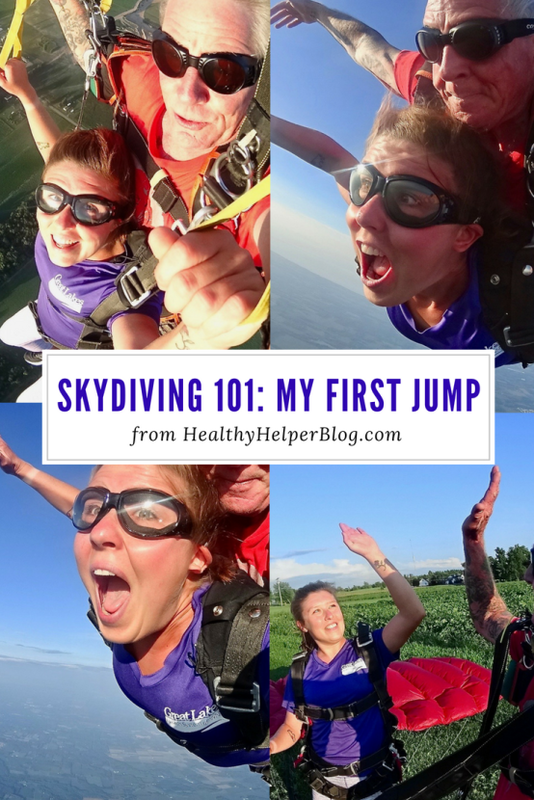 Last August, Kaila Proulx did her very first jump with us – and she so vividly and eloquently wrote about it in her blog “Healthy Helper”, we wanted to share it with our community and readers as well (reprinted with gracious permission from Kaila). If you couldn’t tell from the title, I recently went SKYDIVING! It’s something I’ve been talking about doing since last year, but to be honest, it was planned super last minute… like within a matter of a few weeks. It all started when I ran into a friend of mine walking home from a local festival earlier this summer. We started chatting about what we’d both been up to this summer and somehow got on the subject of both being interested in going skydiving someday. I had mentioned that I’d done some research on local skydiving companies and that there were to reputable ones within an hours drive of our area. My friend, Denny, said he’d be on board if I really wanted to schedule a jump and I was so excited to finally have someone to go with! Later that night, we texted back and forth and decided on our jump date a few weeks in the future. When the fateful Sunday came, we were both FULL of excitement for our first skydiving experience. He had been bungee jumping before and I’ve done my fair share of zip-lining, but neither of us figured that either of those of experiences would prepare us for what we had in store. The drive there didn’t happen without a slight delay. As soon as we got off the through-way on to the exit towards the small town where the skydiving facility was, Denny’s car started to make a strange noise, forcing us to pull over on a busy interstate. Only 20 minutes away from WNY Skydiving (the place where we were going), we discovered we had a flat. At that point, I felt pretty defeated. Our scheduled time was 4pm – the last appointment time of the day – so I figured they wouldn’t be able to wait for or delay the operations for us since we were racing against the light. We called AAA and hoped for the best. Of course AAA always gives the worst case scenario and told us a mechanic would be out in about an hour to fix the tire. We called WNY Skydiving and let them know our predicament. Luckily, they were SUPER accommodating and said we could still come despite the delay. As fate would have it, the mechanic showed up about 15 minutes later, way ahead of schedule, and we were on our way 10 minutes later. We arrived at WNY Skydiving at 4:30 and met up with the other people who were scheduled in our time slot. We all filed into the “training” room and learned what we would have to keep in mind while in the air. I have to admit…it was A LOT of information. I was a bit nervous I wouldn’t remember everything in the excitement of it all, but the instructors assured us that the most important thing was to remember to “arch” our bodies the entire time we were free-falling; head, neck, back, legs, everything. As long as we did that, all would be fine. Once we were trained, we signed the paperwork (that paperwork was NO joke…we’re talking like 20 pages of initials and signatures!) and waited for our turn to jump. Kaila Proulx and her friend are in harness and ready for their first skydiving experience. We ended up waiting about 3 hours to get into our harnesses for our turn. But it wasn’t boring or anything. We were filled with anticipation the whole time and it was actually really fun getting to talk to other skydivers (people with their own licensees, other instructors, and people from the public) about their experience. We also got to see a lot of other people come in and land which was really cool! When out turn came, we were informed we were the final jump of the night… the “sunset jump”. I was never really scared during the whole afternoon, but when they told us it was our turn, my heart definitely started to beat a little faster. Knowing my instructor was ex-military and had over 1500 jumps under his belt made me feel incredibly safe throughout the experience. And now to answer the question…“would I jump again?” HELL YES. Tomorrow, if I could. In fact, I plan to go back in a few weeks for my second (a more advanced) jump! 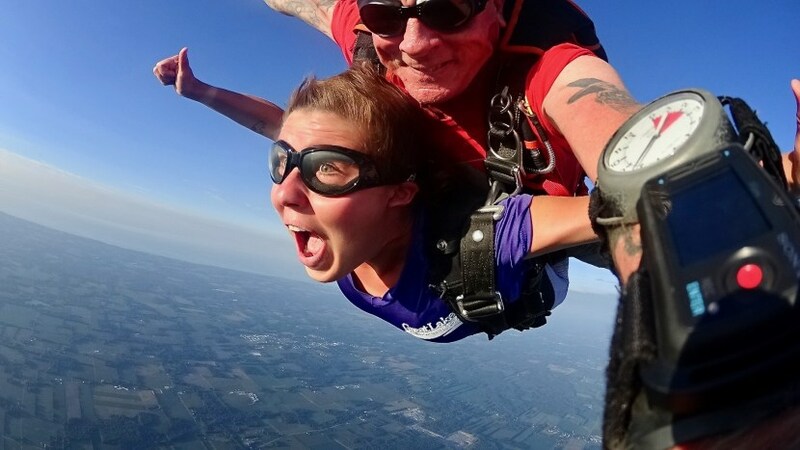 The team here at WNY Skydiving is so honored and delighted that we were able to provide Kaila with the skydiving experience of a life time – and we can’t wait to have her back! Inspired by Kaila’s story? Ready for your own first jump? Book your skydive online – it’s quick and easy.